Five kilometers from the Mediterranean and on your way to Jezzine, you clearly spot an old hill with stone houses and red brick roofs that tell the ancient story of the Mediterranean coast. The Phoenician Alphabet and the sailors that traveled in the high seas for their trade. This tells the story of the Grandfathers who sailed with their olive oil, olives, almonds, raisins, and oregano to Egypt where it was sold to the rich Lebanese immigrants against gold sovereigns which were used to buy the lands of Salhiye. The fertile land of Salhiye was owned by a bureaucratic family and by the Monastery of the St. Savior (Dayr Al Mkhalless) a Roman Catholic Monastery. The inhabitants of Salhiye bought the share of those bureaucrats but could not buy the share of the monastery. They all converted their belief to the Greek Orthodox church led by father Michael Kassab in the year 1840. Father Kassab left Salhiye with Tannous Touma to Houran in Syria and gathered some money which enabled the inhabitants to buy a piece of land at the western edge of the village and build on it a new church, Church of The Savior. They used to gather every day after finishing their daily work and start moving stones from a near by village, Abra to Salhiye. The builders were from Al Choueir in AlMaten. After a few years, the church of the savior was completed and Salhiye started having two churches. The Saint John The Baptist Church that was built earlier with a wooden roof at the middle of the village and the Savior church at the western edge of the village. Salhiye started growing and became the center of Iqlim Ettufah area where the ruler resided and it also became the winter center of the judicial of Jezzine. Father Michael Kassab died and a new priest was assigned, one of the inhabitants, Father Michael Dandan. This new priest led again the inhabitants to reconcile with the monastery of the Saint Savior. The inhabitants returned to their old Roman Catholic belief. At that time, there started a campaign for the purchase of the land that was owned by the Monastery of the Saint Savior. They formed a committee led by Salim Abu Chouaib and representatives of the main ten families: Father Michael Dandan, Mayor Ibrahim Mansour Hadad, Jabbour Youssef, Elias George El Achkar, Hanna Andrawos, Elias El Koukhi, Youssef Hanna Abboud, George Makhoul, Tannous Ibrahim, and Abdou Daoud El Chamieh. The committee negotiated with the monastery for the purchase of their share in the land and the purchase was completed by the year 1875. The inhabitants paid tribute to father Michael Dandan who led them to own their beloved land and to return to the Roman Catholic Church. After the reconciliation with the monastery for the purchase of the rest of the land, the inhabitants enjoyed better economy and their number increased. The small Saint John church with the wooden roof became too small. At that time they decided to build a new church in place of the old one. There happened to be in Salhiye the master mason Mansour El Kourani from Choueifat who was building an olive oil factory for El Koukhy family. The inhabitants contracted him to build their new church. That mason was a master in building stone arches and his work is today remembered as a master piece. Work started in 1874 and continued for ten years and some of the inhabitants helped master Mansour and even learned that art from him. One of the assistants of Master Mansour was Bechara Khalil Dib. 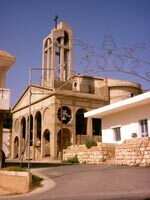 Years passed and the church of the Savior at the western edge of the village which became the subject of the Greek Orthodox church had no parish and the Archbishop agreed to sell the church to MR. Rachid Jounblat. The news came to father Youssef Dandan, the priest of the village at that time. He immediately went to Archbishop Abu Rjaili and requested him not to sell the church because the inhabitants will not allow that and offered to buy the church and its land. The Archbishop was convinced and promised to sell it to the inhabitants of Salhiye at a lower price. But where can father Youssef bring the money from? He decided to visit father Aghnatios Haddad, a priest from Salhiye who lived in Beirut and had high level contacts, who was convinced to help and he offered 7500 Lebanese Pounds which was paid to the Greek Orthodox Church as a price for the church of the Savior plus the land surrounding it. The church was then repaired under the supervision of Father Youssef Dandan. That was in the year 1945. After the completion of the repairs of the Savior church, the inhabitants held a celebration with the blessing of Archbishop Nicola Nabaa who promoted father Aghnatios and gave father Youssef a special stone in recognition of their efforts to retain the church for Salhiye. Both were buried in a special grave inside that church. In 1985, after 100 years from the completion of St. John The Baptist church, the people of Salhiye gathered again and agreed to share the cost of building the Nartex (Parish Hall) in front of their church. They did not fear the troubles that were surrounding the area. Their wish was only to follow the steps of their ancestors and their belief was in God, their land and man. THE UNTHINKABLE HAPPENED. No one believed the catastrophe will happen but it did. 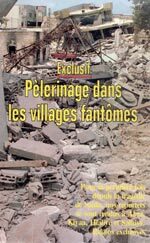 Soon after the centenary celebrations, an unthinkable war flared in the area including Salhiye and extremist militias threw the inhabitants out of their homes and raised the village and both churches to rubble after looting it. The people of Salhiye became refugees as all the inhabitants of the East of Sidon comprising around 100,000 Roman Catholics. Some of them immigrated to the Western World and Australia, the rest settled in East Beirut and restarted their new cycle of life under the most difficult conditions of shelling and street bombs. They all started working hard to secure their new homes and earn their living and teach their children. They always dreamed to return to their village, its valleys and to St. John The Baptist Church. They were full with sorrow and despair and some weakened by the pressure of land brokers sold their land. But hope started to shine through the efforts of Father Georges Kouiter (Now Archbishop of Sidon and Deir el Qamar) and Father Salim Ghazal (Now Head of The St. Saviour Monastery). In the summer of 1991, the sun shined again on the inhabitants of Salhiye and hope prevailed as the war was over and the state of law came again. The bells of return started ringing. The inhabitants returned to the rubble of their village and they realized that many things were lost forever. However the strong will refused to cry on these rubbles and hope stepped again into their hearts. Their belief, faith, love and hope could make miracles and thus they started working again. The job was enormous and where to start, to remove the rubble or clean the roads from wild herbs, or to cultivate the olive trees that were abandoned for years. The thousand mile trip had just started. It’s the rebuilding of a village hundreds of years old. With the help of God and the support of our Archbishop Georges Koueiter and the efforts of the inhabitants and support of their families in Lebanon and abroad and help from Catholics all over the world, Salhiye and St. John The Baptist Church will rise from the rubble. On 10th August 2002, a Mass was held in St. John The Baptist Church that was few days after the completion of the church’s concrete roof. After reading the Gospel, the priest Michel Wakim gave an affectionate speech that made people shed a tear when he announced that the church’s raw concrete structure is finished and that their dream is coming true. The people of Salhiye were joyful as it was the first time they celebrated Sunday prayers with the full concrete structure of the church after its destruction in 1985. Initially they celebrated mass on the concrete slab of the foundation then in the parish hall that was completed two years ago and will remain the temporary church until the remaining works are completed. We thank God and our St. John The Baptist for this grace. We replanted the faith and hope in our hearts because the most important stage in rebuilding the church has been realized. The people of Salhiye feel proud of this achievement and call upon the faithful Catholics all over the world and the sons of Salhiye and their friends in Lebanon, the Gulf, Europe, Canada and the United States and the Knights Of Columbus members all over the world to donate generously to help in completion of the following works: electrical, tiling, painting, doors, and windows. Your help would fulfill our commitment to the faith of our ancestors who built our old church one hundred and twenty five years ago and where our Lord Jesus Christ walked and preached. 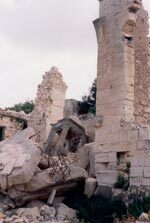 St. John The Baptist Church destroyed.